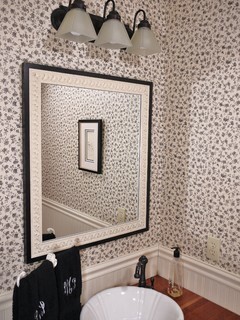 Are you looking for a Custom Framed Wall Mirror for your Living Room, Hallway, Dining Room, Bathroom or Office? Morningside Gallery in Latham, NY will be happy to work with you through the process of creating the perfect custom framed mirror for you. Our custom framed wall mirrors not only add style and class to any room, but with over 1000 frames to choose from, you can find a custom frame to fit your style or theme. Whether you’re looking for a large decorative mirror for your living room to make your space seem larger and brighter, or a practical and durable mirror to enhance the look of your master bathroom, Morningside Gallery will create the Custom Frame style and finish to help you meet your goals. Consider the use of the mirror and style/color of the furniture or room when deciding on the size/placement of a custom framed mirror. Do you want the mirror for functionality, decoration, or both? For instance, a wall mirror for your children’s bathroom needs to be used and withstand the rigors of water, toothpaste, and little hands, while a living room or hallway mirror needs to look good and be admired. Each mirror can be created with traditional flat glass or 1 inch beveled style. A beveled mirror may add a touch of elegance to your wall. The outer edges of the mirror are ground to an angle giving it a raised look. Beveling has no impact on the durability of a mirror and is more of a style choice than anything else. Each mirror is custom framed just for you by our team of trained experts. We will work with you to properly measure the space where your mirror will be placed and accurately create a custom framed mirror that you will be delighted to see yourself in day after day.